Deckard: I don't know why he saved my life. Maybe in those last moments he loved life more than he ever had before. Not just his life, anybody's life, my life. All he'd wanted were the same answers the rest of us want. Where did I come from? Where am I going? How long have I got? All I could do was sit there and watch him die. Batty: It's not an easy thing to meet your maker. Chosen answer: The language is Chinese Cantonese, and is saying something like "... Now we can more time. ", and when the replicants came inside the lab he says "... What a f*** doing here..."
Question: When Roy confronts Tyrell, he says something that I'm having difficulty figuring out. The captions read that he is saying "I want more life... father!" But to me, and I've listened to that part over and over trying to figure it out, it sounds like he is saying "I want more life... fucker!" So is he saying Father, or Fucker? Chosen answer: It's a more complicated question than you might think. Two versions of the scene were filmed, the main one, where Roy says "fucker" and an alternate, originally intended for use on television, where he says "father." Different versions of the movie use different takes. Of the three best known variants, the original theatrical release and the inaccurately-named Director's Cut both use the "fucker" line, whereas the Final Cut, the only one that Ridley Scott had full control over, uses the "father" line. What he's saying will depend on which version of the movie you were watching. Only you can answer that one. Question: I'm aware that there is debate on whether or not Deckard was a replicant, but as I was watching the movie, I couldn't see any clues as to why anybody would think this. Did I miss something obvious? Why do people think this? Chosen answer: The two most notable hints are as follows. The first (which is only in the Director's Cut) is that after Deckard dreams of a unicorn, Graf makes an origami unicorn and leaves it at Deckard's apartment. Some people interpret this as suggesting that they're aware of the memories that have been given to Deckard to prevent him realising his true nature. 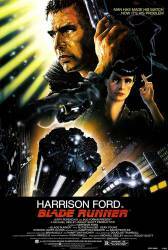 The second hint is that replicant eyes glow in certain lights - at one point in the film, Deckard's eyes can be seen glowing in the same fashion. Ridley Scott has stated on several occasions that, as far as he's concerned, Deckard is a replicant, but he does concede that they deliberately left it as somewhat ambiguous - the viewer should decide for themselves.